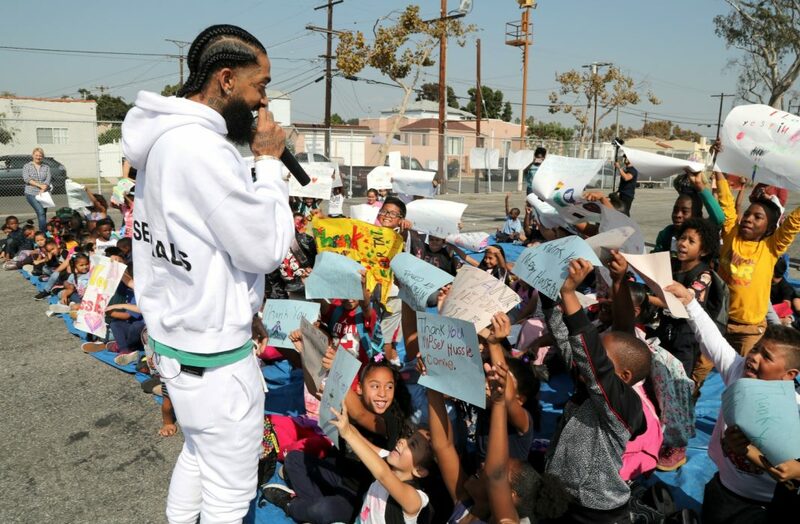 The musician, entrepreneur, and community activist was working on a number of projects in South L.A.
As the search for Nipsey Hussle’s killer goes on and mourning continues, many have spoken out about the numerous ways he was actively working to spread a message of positivity in Los Angeles and beyond. Strikingly, he was scheduled to meet with the LAPD on April 1, the very day after his murder. Hussle and a team from Roc Nation were to discuss initiatives to calm gang violence with Commissioner Steve Soboroff and Chief Michel Moore. The rapper and two other men were shot outside the flagship store of Hussle’s clothing brand, the Marathon Clothing. The shop is located in a shopping plaza that Hussle had recently purchased in its entirety with the intention of eventually razing and replacing it with a mixed-use development with apartments and retail, capitalizing on the arrival of a light rail transit line connecting the neighborhood to LAX. As Forbes reported in February, Hussle was working with private-equity investor Dave Gross on that project, which would have included around 100 residential units, and was set to benefit from a program that incentivizes investment in designated Opportunity Zones within lower-income communities. Gross and Hussle were also partnered on a STEM education center called Too Big to Fail–a “bridge between Silicon Valley and the inner city,” according to Blavity–operating alongside their coworking space and startup incubator, Vector90. These developments are all centered around Crenshaw and Slauson, the very corner where Hussle once sold incense and CDs to make money before he pulled himself out of poverty through his combination of musical talent and business acumen. His business partner Gross is expected to continue managing the projects in the short term. But Hussle’s neighborhood development initiatives were far from the only things he had going on at the time of his death. Some, including celebrity fans Nick Cannon and Chingy, have noted that he was working on a documentary about Alfredo Darrington Bowman, better known as Dr. Sebi, an African healer who advocated for holistic treatments for medical conditions including AIDS and reportedly treated Michael Jackson for an addiction to painkillers with an herbal and diet-based program. Sebi died in 2016 while in custody of Honduran law enforcement, sparking theories that he was the victim of foul play perpetrated by powerful interests opposed to his alternative health teachings. Lisa “Left Eye” Lopes of TLC had been a follower of Sebi’s teachings, and some linked her 2002 death to a conspiracy to quash Sebi’s work, which has now been extended to include Hussle. Cannon confirmed Monday that he is committed to finishing production on the documentary. And of course, there was the music. Hussle, who was nominated for a 2019 Best Rap Album Grammy for his record Victory Lap, was working on new material. Singer John Legend noted that he, Hussle, and DJ Khaled had filmed a video for a new song only Thursday.